mommy's reviews: Father's Day Gift Ideas...For Hubby's Office! When I met my hubby he was a typical bachelor. He did dishes when the clean ones were all dirty. He NEVER cleaned his bathroom...he took his laundry to the laundromat and he ate all his meals at his computer desk. He did have a kitchen table, but he used it for a catch-all. Papers, magazines, bills, etc. were all strewn about on the table. After one year of courting, we were married and suddenly, both of our belongings were under one roof. Quite honestly, I had more than him. :) But this was not necessarily a bad thing. Most of what I had made our house a home and we truly had a wonderful start. One item that my husband brought with him when we were married was an office chair. Being that he sat at his computer desk alot this was an item that he really used quite a bit. We have been married almost 5 years now and he still has the same chair and I have been wanting to get him a new one. So, with Father's Day right around the corner I thought that I would write about some great gift ideas to spruce up hubby's office! 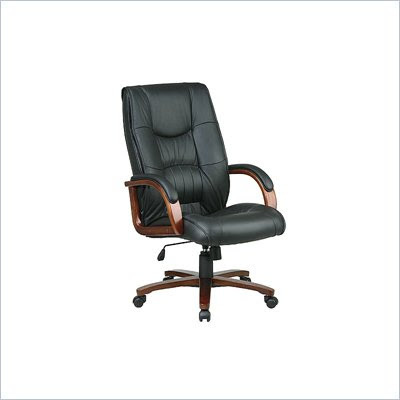 Another of Cymax's stores, moreofficechairs.com has a really wonderful selection of chairs...including some fantastic clearance office chairs. I have seen some gorgeous chairs that would be amazing gifts. My husband is a System's Analyst so he spends alot of time at his computer. So comfort is my first priority when looking for a chair for him. One type of chair that I would love for him to have is an ergonomic office chair. Ergonomic basically means that it is good for your posture and conforms to you naturally without compromising your body's structure and comfort. The chair pictured above is so stunning...wow. 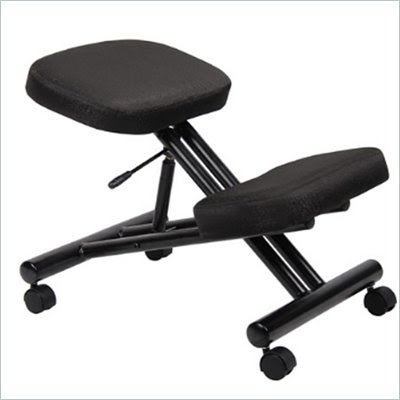 It is also VERY ergonomic in that it has built-in lumbar support, pneumatic seat adjustment and padded arm rests. I LOVE the cherry wood finish too...it looks so classy! If you are looking for a really different way to sit at your desk then you have got to take a look at this ergonomic kneeling stool. I have NEVER seen anything quite like this before. So, it looks odd but what it does is it eases the hips forward and encourages an upright posture by aligning your back, shoulder and neck. This relieves strain on your lumbar muscles. To me, I would love to try this stool out just to see how it would feel on my knees. I cannot imagine kneeling all day but I assume it is made to provide ultimate comfort...not discomfort! So, there you have it! Some really great ideas for your man this Father's Day! 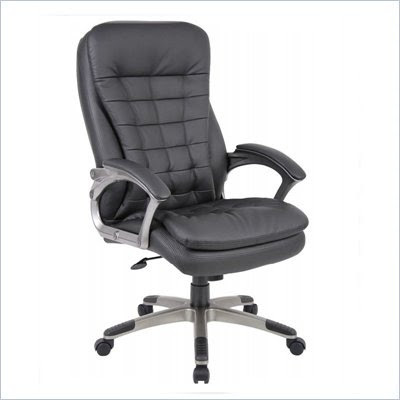 Have a look around moreofficechairs.com and see what else they have to offer! The selection is amazing and the prices are even better! Make it a Father's Day to remember! Sounds just like my husband! I would love the kneeling stool. Looks really neat! I sooooooo need a new office chair...maybe this will be good Father's Day gift, but I am thinking it should be a late Mother's Day gift! HA AH! My hubby could use a new office chair. There are so many different kinds it's hard to know which one to pick! Those are some comfy looking chairs! That would be a great gift for anyone who spends a lot of time at their desk. :o My hubby would LOVE these chairs. I think he would make it his "gaming" chair! I'm loving the chair with the cherry wood finish, it would fit in with the rest of my office furniture.